Wendy's new release of Sweetness Without Sugar, the book, is a resource that I know many of you will love. For those of my nutrition education clients who have been struggling with the sugars as they relate to your dietary plan, I strongly encourage you to grab a copy ASAP. What you'll find inside the pages goes far beyond recipes. Wendy delivers healthy alternatives to sugar without using artificial sugar substitutes. Her recipes combine whole food ingredients to deliver maximum nutrient value. 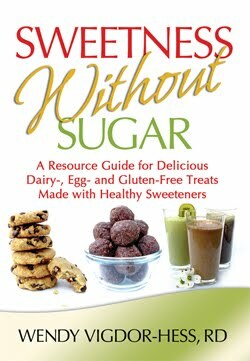 For those who have not yet learned what all the more natural sugar substitutes are, this book will define them, explain them, and teach you how to use them. No detail has been overlooked and Wendy begins the book by answering all the questions that are bound to come up when one is learning about wholesome sugar substitutes. To get a copy, jump on over to Wendy's Book Site Here.